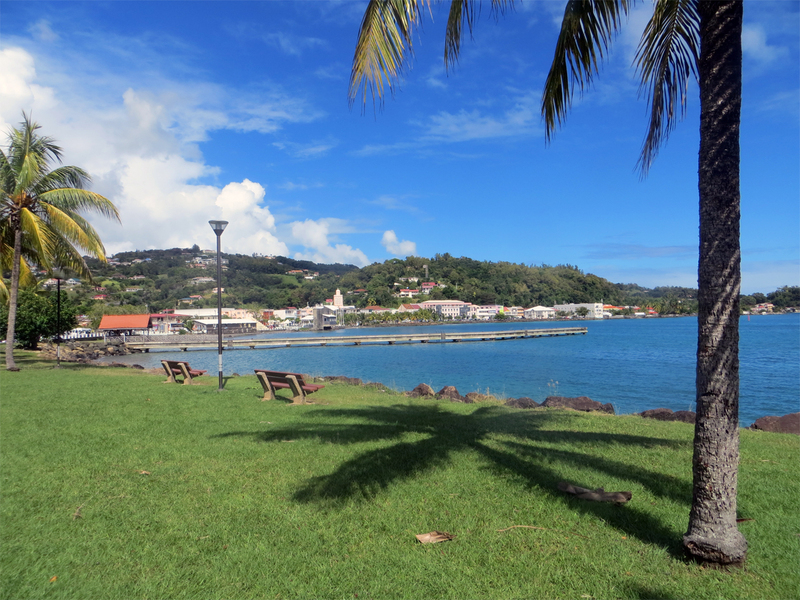 On Thursday March 6th, Cutter Loose is under sail from the metropolitan city of Fort-de-France across the Bay to Anse Mitan, a compact resort town on the Pointe du Bout peninsula. 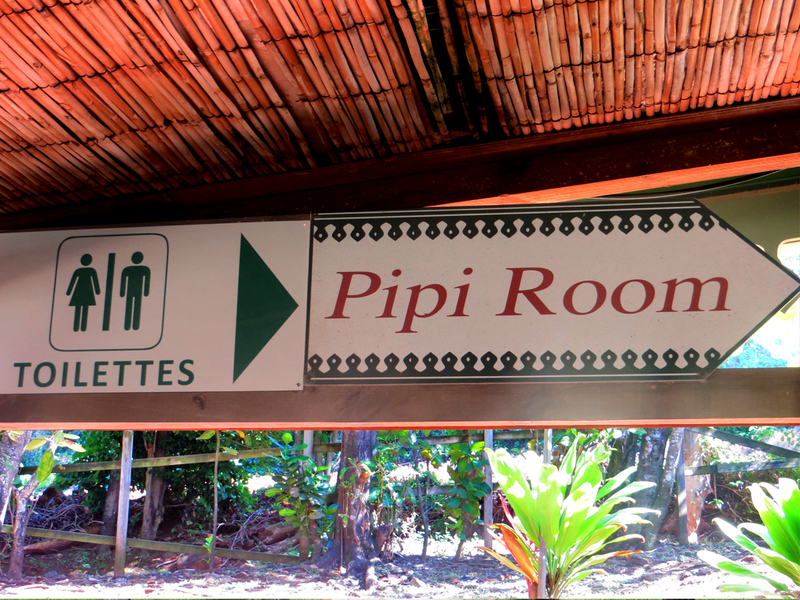 Several hotels and villas provide accommodations for land-based tourists who use Anse Mitan as a base for exploring the island. Frequent ferry service connects Anse Mitan with Fort-de-France. Each day, Main Street becomes filled with day tourists who arrive here by ferry or rental car. They come here to enjoy the trendy clothing shops, bars, restaurants and beaches. 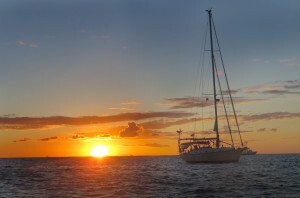 Cruising sailors are attracted to Anse Mitan as a slower paced alternative to Fort-de-France. 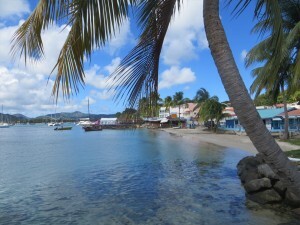 Other than a small marina filled with local boats, there are no marine services available in Anse Mitan. Its protected anchorage, beaches and sidewalk patisseries are a sufficient draw to attract dozens of cruising boats. 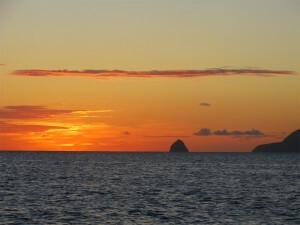 Given its western exposure, the anchorage offers outstanding sunset views. At night, the lights of Fort de France twinkle in the distance. 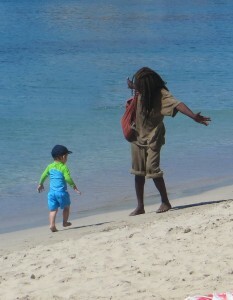 Not everything is picture perfect in Anse Mitan. 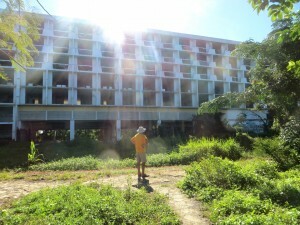 The Kalenda Hotel was once the premier resort destination on the Pointe de Bout peninsula. Now, its graffiti covered ruins serve as a constant reminder of the destructive power of hurricanes here in the Caribbean. 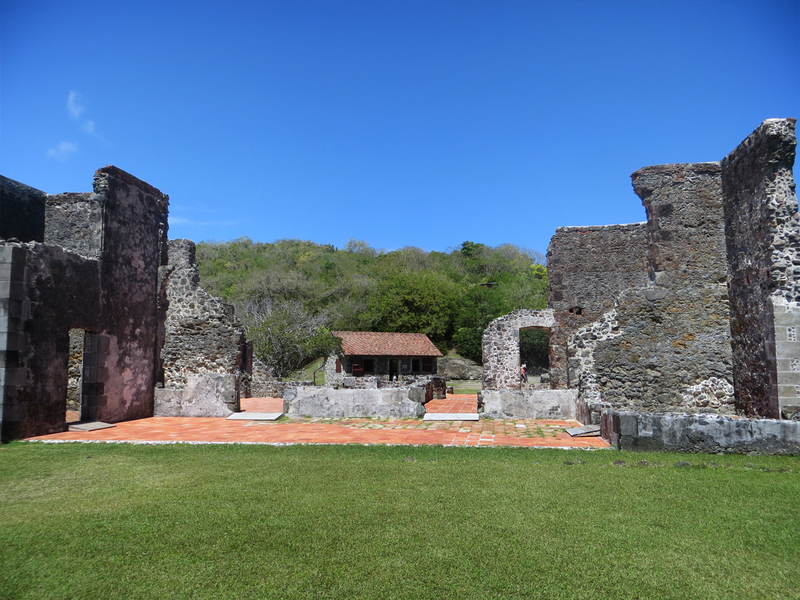 With five rental car agencies, Anse Mitan is an excellent place to begin a self-directed driving tour of the island. On Monday March 10th, we are off in our rental car to tour Martinique’s magnificent east coast. Commuter traffic congestion is already building as we enter the six lane N5 expressway to Fort-de-France at the Riviere Salee interchange. 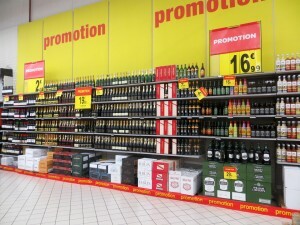 To escape the bottleneck near the Aime Cesaire International Airport, we exit the N5 and drive east to the town of Le Francois, then north on the rural coastal road to Le Robert and on to La Trinite. This highway offers outstanding views of Martinique’s Atlantic coastline with its numerous numerous islands, bays and craggy headlands. Our destination this morning is Presque’ Ile la Caravelle. This peninsula juts east eight miles into the Atlantic Ocean. The trailhead to an interesting network of hiking trails is located at Chateau Dubuc, a coffee plantation dating to 1671. The Chateau was later appropriated by the French military to fend off attacks from the British Navy. It was destroyed by the great hurricane of 1766. 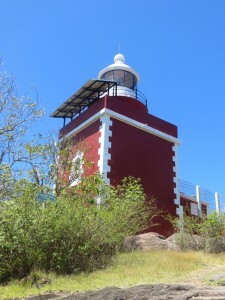 From the Chateau, it is an easy 30 minute hike to the Caravelle lighthouse. 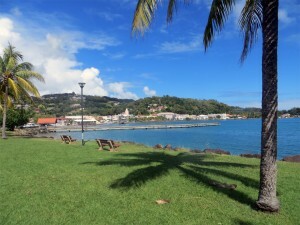 Given the elevation of this vantage point, the Nature Island of Dominica is clearly visible forty miles to the north. 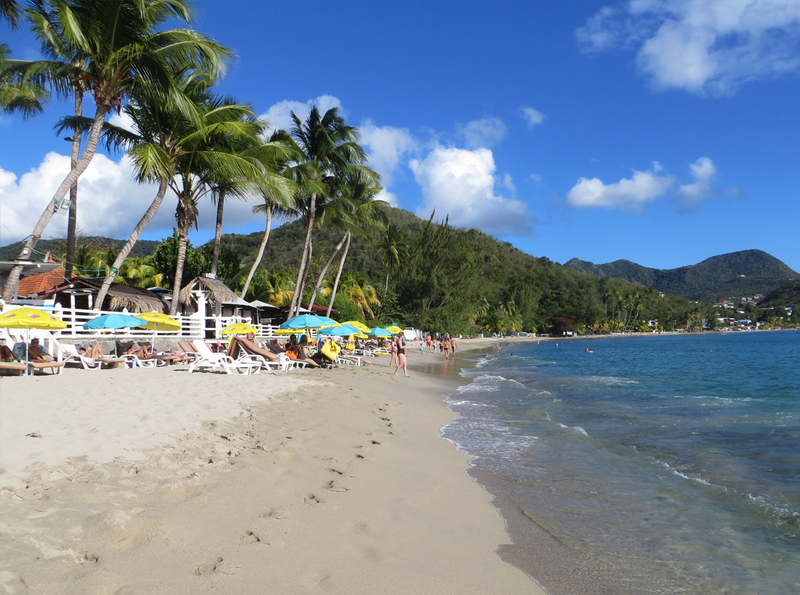 Following our visit to Caravelle, we continue north along the coast through the town of Sainte Marie and on to Marigot for a leisurely mid afternoon lunch at Anse Charpentier. No meal is complete without a visit to the Pipi Room. On the return trip to Anse Mitan, we exit the N5 expressway in Genipa to shop at the huge Carrefour supermarket. With its huge selection of fresh meats, fruits, vegetables and cheeses, this store is light years ahead of its sister stores in downtown Fort-de-France in terms of selection and quality. 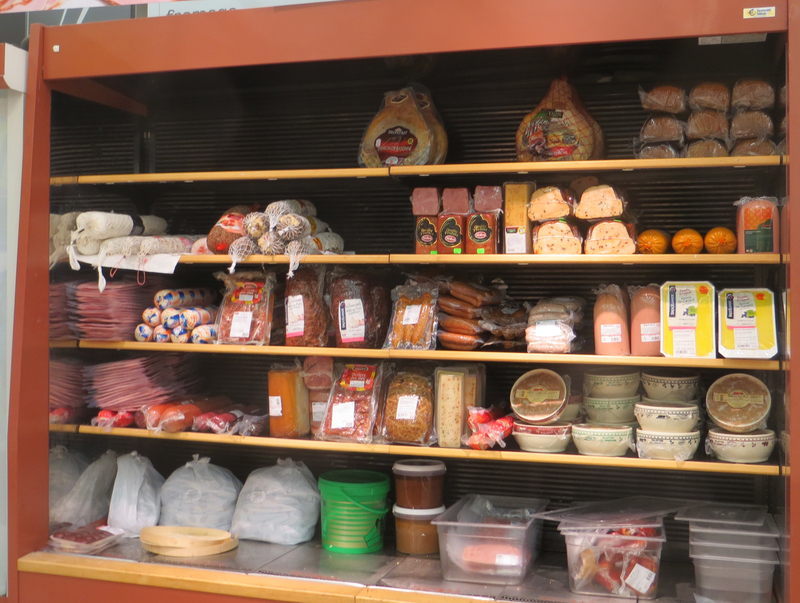 It is obvious that this particular store caters to a more affluent suburban clientele. 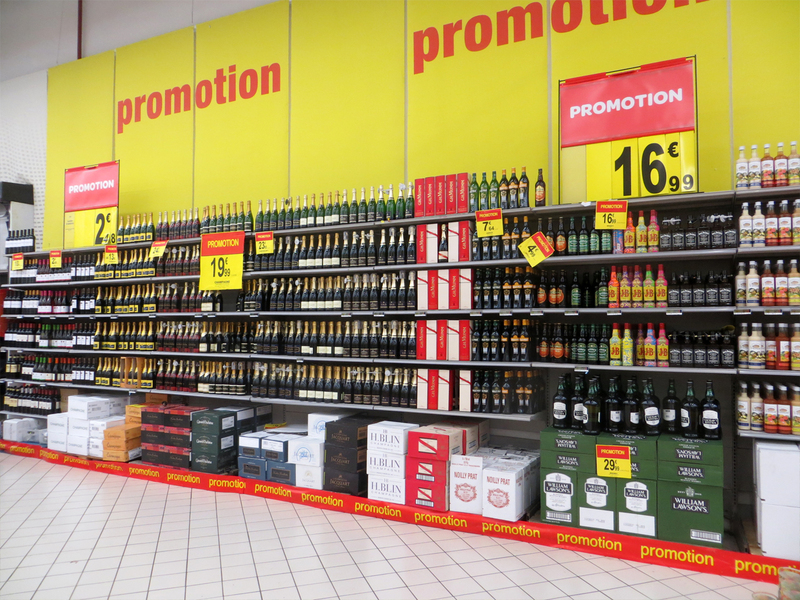 Our nearsighted perception that all grocery stores in the French islands are alike turns out to be incorrect. 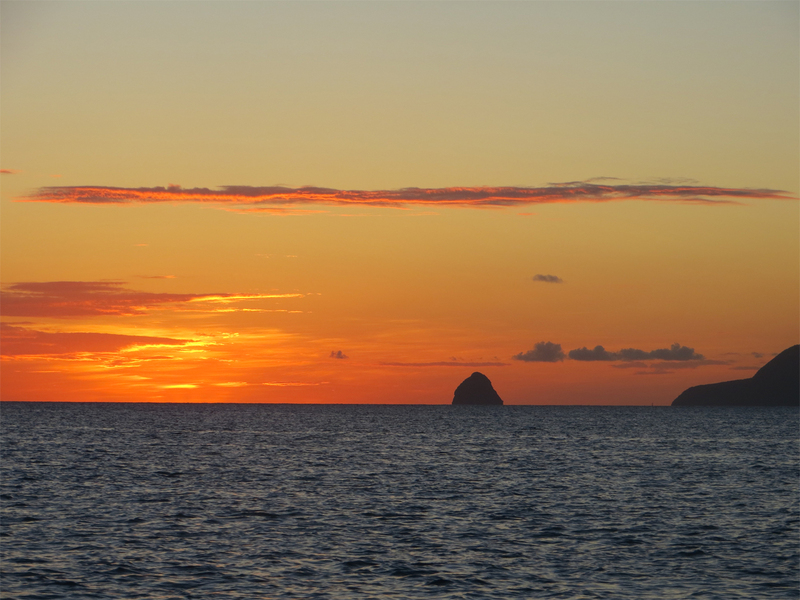 While cruising, one’s impressions of an island are formed primarily on the basis of a coastal orientation. 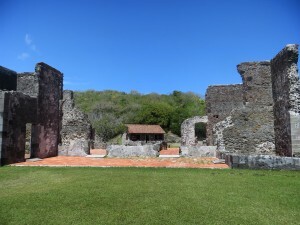 Touring the interior of Martinique and the suburbs of Fort-de-France is an eye-opening experience. Thanks to support from mother France, the island’s roads and highways are in excellent condition with good signage. The island’s economy appears robust, as evidenced by a vast industrial zone surrounding the airport. 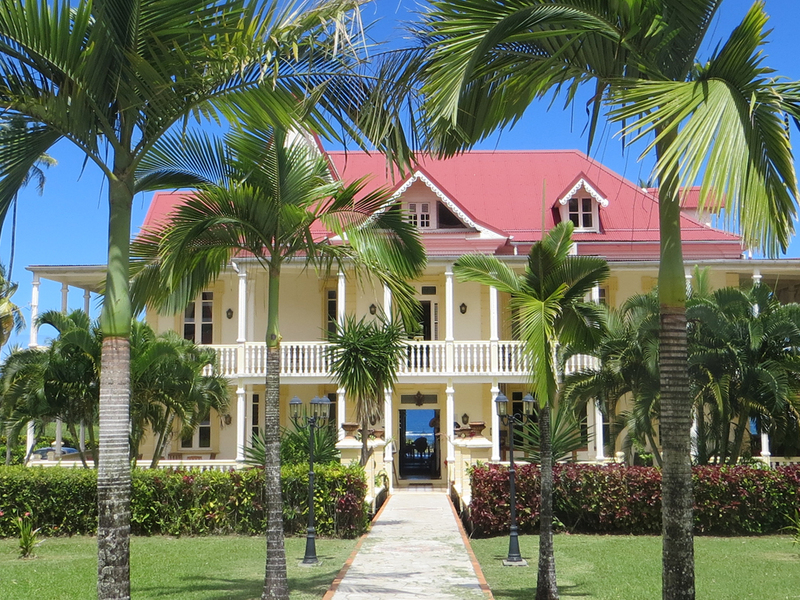 The quality and diversity of the housing stock far exceeds that of other islands we have visited. 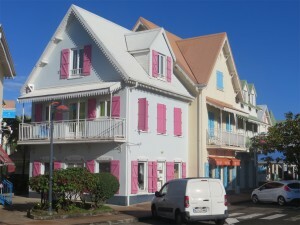 Satellite dishes are mounted on many homes and apartment buildings in Martinique. 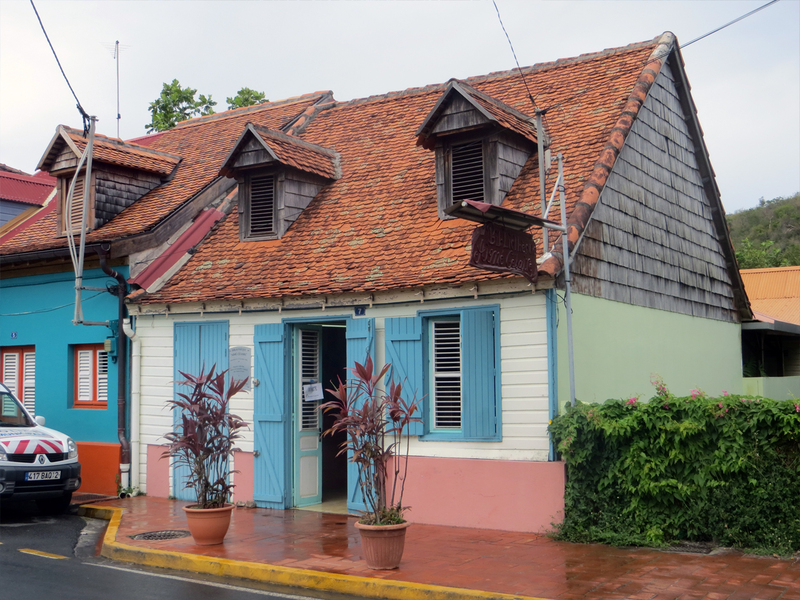 Generally speaking, the Martiniquais appear to be more prosperous than their Caribbean neighbors. 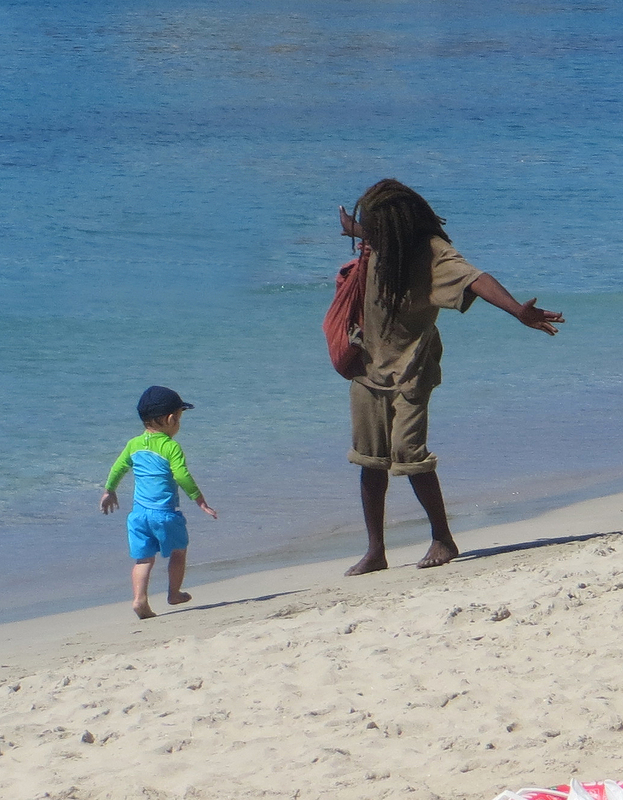 Conspicuous for their absence are panhandlers on the streets of Fort-de-France and scheming boat boys in the harbors. 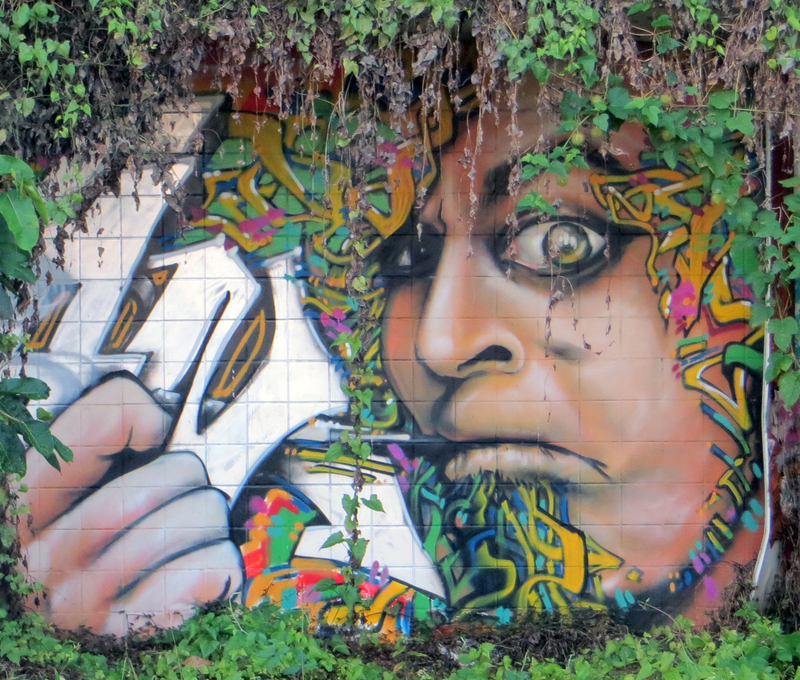 Granted, there are certain neighborhoods in Fort-de-France that are struggling, but this is indicative of a city that is over 400 years in age. To our disappointment, there are relatively few Wi Fi hotspots in the Fort-de-France metropolitan area as most residents gain Internet access by way of 3G smartphone service. 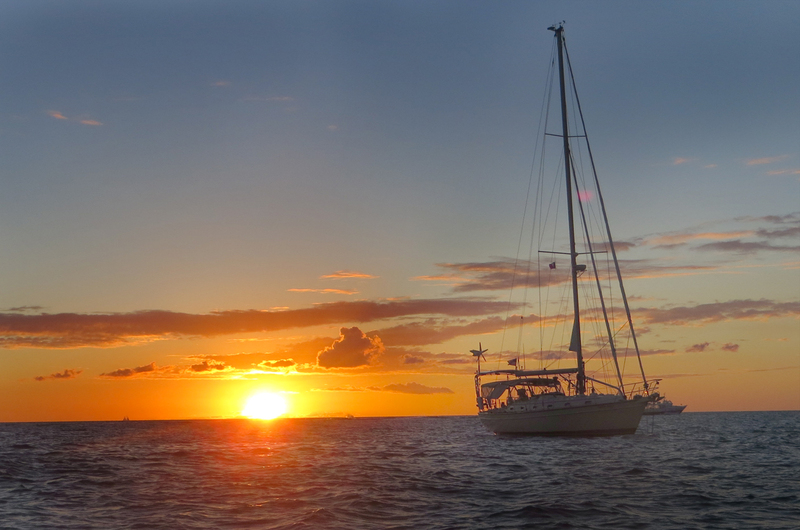 The anchor is up in Anse Mitan on Tuesday March 11th en route to Grande Anse de Arlet. 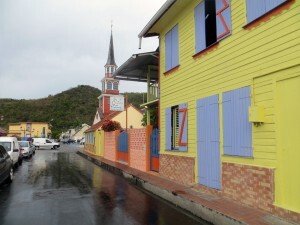 This is a sleepy little one street beach town on Martinique’s west coast. The town encourages visits from cruising yachts through the provision of free moorings. Since there are no lines on the mooring ball, boaters must feed a mooring line through a metal loop at the top of the ball. This is quite a challenge from the deck of a sailboat since the top of the ball rests about 15 inches above the water. One of the prime forms of entertainment in the harbor is to watch arriving yachts attempt to capture a mooring ball. Settled weather remains in effect during our two day visit to Grande Anse de Arlet. One minute, there is barely a hint of a breeze. The next minute, winds of up to 20 knots accompany a passing shower. In the absence of sustained wind, boats in the harbor are riding to current and swimming 360 degrees around their moorings. Several times each day, the mooring ball raps against the hull, signaling a turn in the tide. Our mooring lines have joined together in a royal tangled mess under the ball. In hindsight, it would have been preferable to anchor in this harbor rather than tie to a mooring ball. On Wednesday 3/12, we hike amidst raindrops to Petite Anse de Arlet, the sister city to the town of Grande Anse de Arlet. As its name implies, it is the smaller of the two towns. Local fishing pirogues dominate the inner harbor, beyond which are anchored a handful of cruising boats in the outer harbor. Despite its size, Main Street is active with tourists who have retreated from the rainy beach to explore the town. 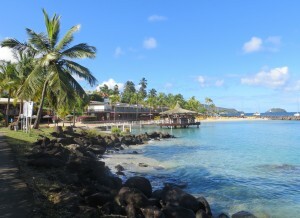 We learn that the Customs clearance computer is no longer available at La Petit Bateau, a beach restaurant in Grande Anse de Arlet. Since the town of Le Marin is the closest clearance center, the anchor is up on Thursday 3/13 to fulfill Customs formalities. 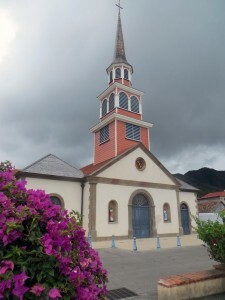 Our destination today is the town of Sainte Anne on the south coast of Martinique. Once beyond Diamond Rock, it is a motorsail directly into 15 knots of wind en route to Sainte Anne. 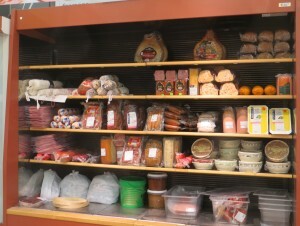 Following the requisite pain chocolat and café on Friday 3/14, we are aboard the 8 AM bus from Sainte Anne to Le Marin. 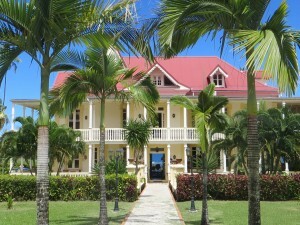 With Customs formalities completed, it is back to Sainte Anne in time for lunch at Paille Coco. 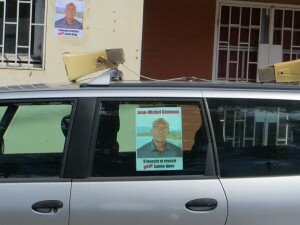 It is election season here in Martinique. Candidates broadcast their message to the electorate in cars with loudspeakers attached to the roof. From morning to night, the blaring sound of stump speeches can be heard for miles. Some candidates drive through the towns and villages speaking extemporaneously to the people, while other candidates broadcast pre-recorded speeches mixed with dramatic music. In the evenings, the town plaza in Sainte Anne is the stage for amplified public speeches by the candidates. One does not actually need to be in the town square to participate in this public forum. The volume is so loud that all of the town’s residents can hear the speeches from the comfort of their homes. The individual speeches are long and these events drag on for hours. Being tolerant and understanding of the noise is the least we can do in support of the democratic process here in Martinique. We have enjoyed a total of 26 days of cruising in Martinique in 2014. Despite the peculiarities of the French, there is much to be said for the lifestyle, food and sightseeing opportunities in Martinique. The tri-color courtesy flag has been neatly folded and placed into storage. The French dictionary is back on the book shelf. 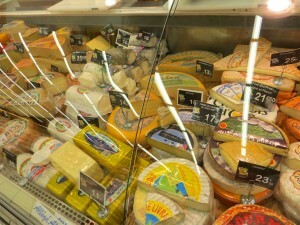 Unspent Euros are secured safely in the vault. On Saturday 3/15, our time here in the French West Indies will come to an end for the season. Cutter Loose will sail south to Saint Lucia in the morning.